Dry and Tablets Dry concentrated formulas utilize the latest in oxygen technology to remove string algae quickly and efficiently from streams and waterfalls- best used as a spot treatment. Use tablets as a preventative in ponds and fountains. Enhance Your Water's Health, Quality, and Appearance with GreenClean Tablets. GreenClean Tablets are the simplest way to achieve a clean and clear water feature. With just a few tablets, your ornamental pond or fountain can look its best. GreenClean Tablets can be used in any season as a regular part of your algae control program. Apply early in the spring to prevent algae growth before it starts. 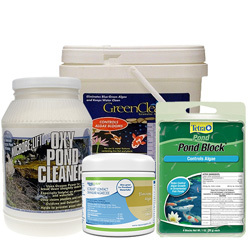 Apply throughout the summer and fall as part of a preventative algae program to keep ponds clean and healthy. GreenClean Tablets can be used in ornamental ponds, water gardens, fountains or any water feature where algae control is required. With the same tried-and-true formula as GreenClean Granular Algaecide, GreenClean Tablets are vital to any maintenance program. GreenClean Tablets are an alternative to copper based algaecides that can harm fish and the environment. Each container of GreenClean Tablets comes with a scoop for easy application. A single scoop will treat up to 200 gallons of water.